The following General Terms and Conditions of Sale govern the offer and sale of products on our web site ("pomellato.com"). 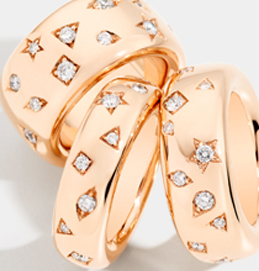 The products purchased on pomellato.com are directly sold by YOOX NET-A-PORTER GROUP S.p.A. ("YOOX NET-A-PORTER GROUP"), company with sole shareholder subject to direction and coordination of Compagnie Financière Richemont S.A. YOOX NET-A-PORTER GROUP S.p.A. is registered with the Companies' Register of Milan under no. 408666, Tax Code and VAT no. IT02050461207. YOOX NET-A-PORTER GROUP's registered office in Italy is located at via Morimondo, 17 – Milano 20143 (hereinafter referred to as "the Vendor" or "We" or "Us"). Requests for information should be made through our Customer Care: click here to contact Customer Care. If you need any assistance, go to the Customer Care Area, where you will find information on orders, shipping, complaint handling, refunds and returning products purchased on pomellato.com, as well as and other general information on the services provided by pomellato.com. The Vendor may not process purchases when there are not sufficient guarantees of solvency, when orders are incomplete or incorrect, or the products are no longer available. In the above cases, we shall inform you by email that the contract has not been executed and that the Vendor has not carried out your purchase order specifying the reasons thereof. If the products displayed on pomellato.com are no longer available at the time of your last access and once the Vendor has received your order form, the Vendor shall inform you of the unavailability of the ordered products within thirty (30) days from the day after Vendor has received your order. If the order form has been sent and the price has been paid for items that are no longer available, the Vendor will refund the amount paid for those items. 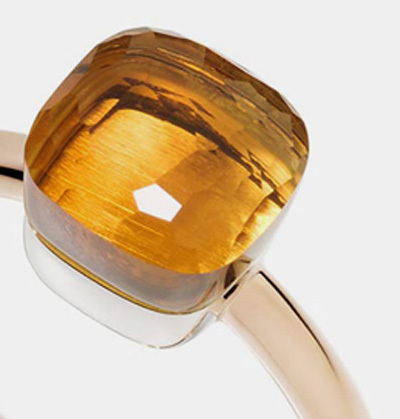 The main characteristics of products are shown on pomellato.com on each product page. 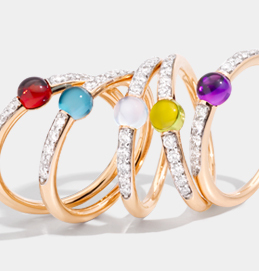 The products offered for sale on pomellato.commay not exactly correspond to the real garments in terms of image and colours due to the Internet browser or monitor used. All products sold by the Vendor are covered by a guarantee for lack of conformity, as provided by the applicable law (6 years in England, Wales and Northern Ireland and 5 years in Scotland). You shall inform the Vendor of the existence of any such lack of conformity within a period of two (2) months from the day when you detected the lack of conformity. Please contact our Customer Care. You may return products purchased from Us, without any penalty and without specifying the reason, within fourteen (14) calendar days from receiving the products purchased on pomellato.com. To return products we invite you to complete the onlineReturn Form before shipping your return package to us. It is necessary to return the items to the Vendor by giving them back to the courier within fourteen (14) calendar days from the date on which the items are delivered to you. return items must be shipped back to Us fourteen (14) calendar days from the date the package was delivered to you. The Vendor shall refund the amount already paid for the purchase of products and the shipping costs of their delivery to you if the products are returned for reasons that may be due to the Vendor, such as when the products do not have the promised essential characteristics, have manufacturing defects or they have been erroneously delivered. The Vendor shall refund amounts already paid as soon as possible and in any case within fourteen (14) calendar days from the date on which We became aware of your decision to exercise your return right. After having confirmed that the terms and conditions stated above have been duly complied with, We will promptly start the refund procedure as indicated in section 8. Whatever payment type you used, the refund procedure shall be started by the Vendor within fourteen (14) calendar days from when the Vendor was informed of your decision to exercise your return right, after checking that the return right has been correctly exercised and that the returned products have been accepted. The Vendor has chosen TNT (which can be contacted through www.tnt.com) as the Vendor's official package delivery company for returning products purchased on pomellato.com. You may return products to the Vendor through TNT by using the pre-printed label enclosed in the package in which the products were delivered. This enables the Vendor to pay for the shipping costs and track the package at any time. If you decide to return products using a different shipping company other than the one indicated by the Vendor, the Vendor will not be responsible for the shipping costs or for any loss or damage to the products. Prices displayed on the pomellato.com website are quoted in pounds. While we try to ensure that all prices on our website are accurate, errors may occur.